Modern, mobile-friendly website design that makes a connection and content that compels prospective patients to choose you over competitors in your local area. The next step is to maximise organic and paid traffic from Google. Our research reveals that over 80% of new patients start their online journey to find a new healthcare practitioner with Google. Social media is a great internal marketing tool to cultivate patient community. The primary benefits are improved patient retention and more referrals. Additionally, social media aids new patient conversion as prospective patients review your social presence before scheduling an appointment. A poor online reputation can be a major liability. 5-star online reviews with Google and other review sites boost new patient conversion by establishing trust. Monitoring poor review and taking the appropriate action is essential to manage your online reputation. Used as an internal and external marketing tool, email marketing helps you engage existing patient relationships and nurture new patient leads. Sending relevant email messages encourages prospective patients to choose you or prompt existing patients to refer you. 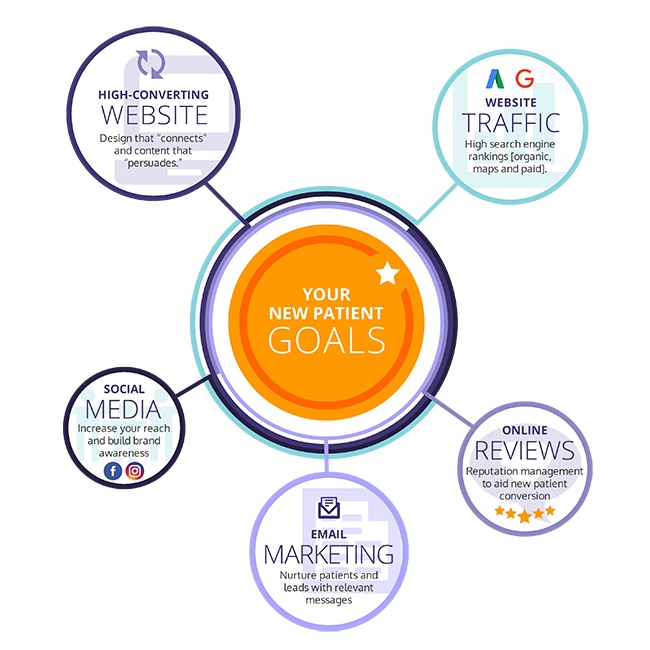 With these five factors in place, your digital marketing efforts will generate a steady flow of new patients from the Internet. Contact us to schedule a free review of your practice’s online presence!